Here I am by my quilts! Wow. I think I still have a Quilt Market hangover. I took many pictures and have much to share, but need some time to process all the bits and pieces. Truly, it is overwhelming. I can’t promise the most inspiring pictures and posts, but I’ll at least try to capture the experience. Stay tuned. I think the craziest part (and my favorite part) was seeing all the people and meeting so many of them. It felt nutty to walk around a corner and go, “Oh look. There’s Amy Butler.” or Heather Bailey, or Sandy Klop. And they acted like just real, regular people. I was struck by how most people were just nice and real and normal and gracious. The other thing I loved was the fact that I was among people who share my interests – or in other words, they ‘get’ my weirdness. 🙂 I’ve been to a couple blogger-meet-up type deals and felt kind of like a dweeb when I explained that my blog is about quilting and sewing. This time I felt like I was sitting smack-dab in the middle of my kind of folks. 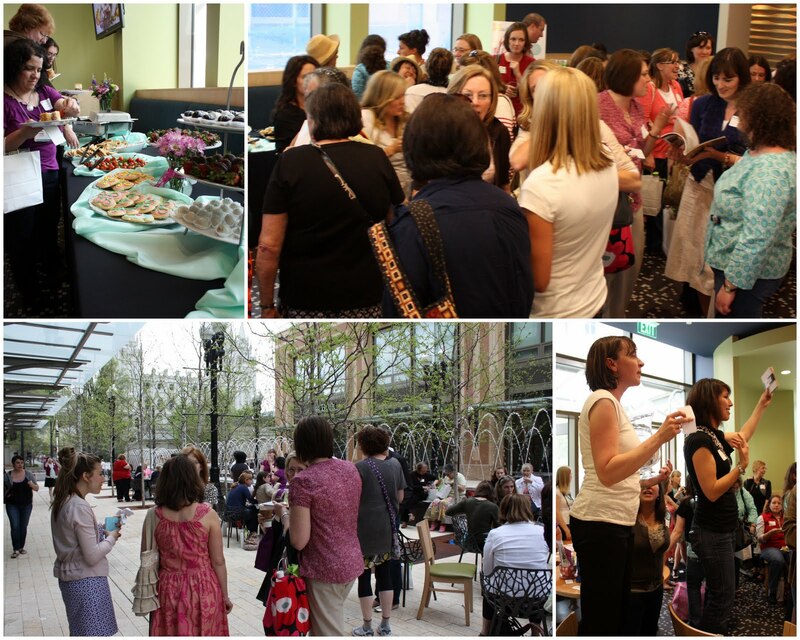 Finally – MANY thanks to those to sponsored, supported and attended the Quilt Market Meetup. Wow! I have never even attempted something like this before and I’ll admit it was stressful. (read: SCARY. Many’s the time I thought about how I’d rather be in my little basement, behind my sewing machine hanging out with Jane Austen.) I lost plenty of sleep over this shindig. (And I nearly had a panic attack when I started pouring buckets of rain and hour and a half before the party.) But the skies cleared just in time and the greatest people showed up and made it so much fun. THANKS to ALL of you. Especially to Calli and Nanette for taking on this endeavor with me and to the SUPER awesome folks who sponsored the event. More pictures and inspiration to come. And I need to get my Bloggers Quilt Festival post up too. And I need to get my house put back together. Yikes. It’s pretty scary around here. My poor kids need some warm weather clothes in their drawers and my kitchen floor is in serious need of a date with a mop. I’m working on that today. Yesterday was about church with the fam, puzzles and play-doh and snuggles on the couch. It was time to just be Mom again. Oh look! A picture of me at the food table! hah!<br /><br />Seriously, your meetup was terrific! And you even knew you were the Amy I was wanting to talk to! Wow…it looks like an amazingly fun time! Thank you for all your hard work witht the meet up it was so much fun. Thanks for letting us help fill the bags. I hope you do another one sometime it was really so much fun for a geek like me. It was so good to meet you! I was thinking about how much work you put into the Blogger&#39;s Meet-Up on the way home. Thanks so much! I have pretty much the same thoughts about market that you do–it was completely amazing and at the same time a bit overwhelming. I&#39;m hoping to collect my thoughts also (and clean my house)! Ditto with the family..they are so important and need us so much! And thanks for all you did to get that meet-up put together! It was lot&#39;s of fun! Bloggers meetup was so much fun!!! It was great to meet you….thanks for all your hard work…I am still putting blogs and people together and absorbing the experience!!! Soooo jealous. Wish I could have come. Great to hear you had such a good time. Everything looks wonderful! I can&#39;t wait to see all the photos and hear about your experiences, I&#39;m so jealous. I can&#39;t wait to see all your recaps! I&#39;ve always been intrigued by market and have wanted to go. I keep hearing of &quot;non-industry&quot; bloggers who are going each year…how do you get in without being a shop owner or something similar?? AWESOME!! SO wish I had been there! can&#39;t wait to see you in October! Your quilts are gorgeous!! On the bright side, the weather has turned cold again, so you don&#39;t need to stress too much about warm weather clothes. 🙂 At least until the weekend. <br /><br />It was so great to finally meet you! The Meetup was a blast. And I am LOVIN my goody bag. Thanks so much for the market meet-up. It was great fun. I do appreciate all the hard that went in to it. It showed. Ah…magical time is over…but it was SO much fun! Thank you for all the work put in, Amy! I just found your blog. I&#39;m so jealous, someday I hope to go to Quilt Market. Looks like a blast, but I loved it when you said &quot;hiding in the basement with your sewing machine and Jane Austen&quot;… that&#39;s so me, too. cheers! xo amy nanaCo.